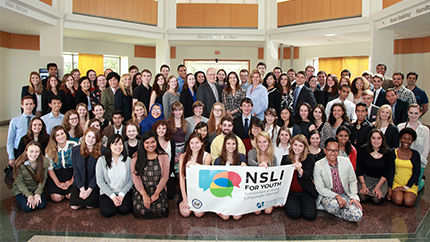 More than 100 alumni of the National Security Language Initiative for Youth (NSLI-Y) Program gathered in Washington, DC on September 20 for Pathways to the Future 2014, an event focused on capitalizing on foreign language skills in career development. Assistant Secretary of State for Educational and Cultural Affairs Evan Ryan spoke to the group, encouraging the alumni to continue their language learning and consider a career with the Department of State. The executive panel also included Cheryl Steele, Senior Associate at Booz Allen Hamilton, and Dan Davidson, President of American Councils for International Education. A second panel with Lead Associates and Creative Directors from Booz Allen Hamilton spoke about their career paths and discussed the importance of empathy, authenticity, and branding in marketing oneself for a job. Following the panels, the alumni engaged in roundtable discussions and networking activities focused on social media and digital networking. This NSLI-Y alumni event was made possible by Booz Allen Hamilton through a public private partnership with ECA.